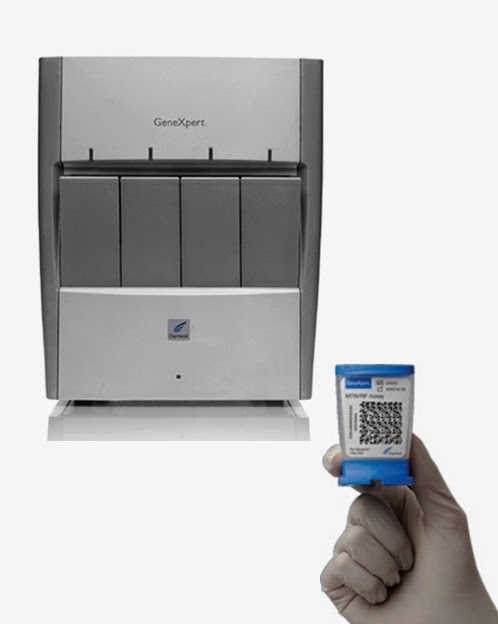 The GeneXpert MTB/RIF is a self-contained, integrated and fully automated, cartridge-based diagnostic test to detect Mycobacterium tuberculosis complex and resistance to Rifampicin (RIF), within 2 hours. This nucleic acid amplification technique (NAAT) based test, with the heminested PCR ensures unprecedented sensitivity in detecting MTB even in smear-negative and culture-positive specimens. This technology was co-developed by the laboratory of Prof. David Alland at the University of Medicine and Dentistry of New Jersey (UMDNJ), Cepheid Inc. and Foundation for Innovative New Diagnostics (FIND), with additional financial support from the US National Institutes of Health (NIH). The World Health Organization (WHO) endorsed GeneXpert MTB/RIF, for use in TB endemic countries in December 2010 and it was approved by US-FDA in 2013. Thus, having the advantages of quicker-turn-around-time, not requiring technical expertise to run and with excellent results from performance evaluation studies from all over the world, GeneXpert test went on to become the darling of physicians treating TB patients. The recent article on GeneXpert published in Times of India (TOI), based on the scientific paper published in Journal of Clinical Microbiology (JCM) by Rufai et al., raised concerns over the accuracy of the GeneXpert MTB/RIF in detecting RIF resistance. This article went on to send shock waves among the healthcare providers and laboratorians, who were in awe of this WHO-endorsed and FDA approved methodology for TB and RIF resistance detection. According to Prof. Sarman Singh, head of the clinical microbiology and molecular medicine division at AIIMS, in Indian scenario, GeneXpert could miss as many as one-third of Rifampicin-resistance cases. He claims that the GeneXpert probes do not recognize a peculiar gene sequence found in the Indian TB strains, thereby posing the threat of giving out false-negative results for Rifampicin-resistance. The double-blinded study conducted at AIIMS, performing comparative analysis with Line Probe Assay (LPA) revaled only 64.4% Rifampicin-monoresistant cases being correctly diagnosed, while missing out the remaining 35.6%. Quoting the findings of this study, Prof. Singh urges the national TB control program managers to evaluate the performance of GeneXpert MTB/RIF before rolling out in the Drug-resistant TB Control Program. However, certain points need to be taken into consideration before going by this study results being sensationalized by media. There have been hundreds of scientific articles evaluating the performance of GeneXpert and to name a few, the WHO expert group meeting report and the Cochrane review highlight the robust data available on the performance of GeneXpert. It is to be noted that, the Cochrane review with the data showing over 95% sensitivity of rifampicin testing, includes a couple of studies which include results from Indian sites (CMC, Vellore and Hinduja Hospital, Mumbai), which had documented excellent sensitivities. Also, a large study conducted by the RNTCP, in collaboration with WHO India and FIND India demonstrated high predictive value for rifampicin resistance by GeneXpert, compared to LPA and liquid culture based DST. To summarize, though the results of this single study do not reflect the global evidence or policies, since the study results are from a credible research institution, it becomes utmost important to verify the claims made in the paper. It is definitely worth investigating further, to know if the Indian resistant strains possess unusual mutations or mixed infections or heteroresistance that bring down the sensitivity of GeneXpert, as claimed. Interestingly, several research groups have already started looking into this perspective and results are awaited. Click here to read the response by the manufacturers of GeneXpert – Cepheid regarding the above mentioned study, quoting several concerns about the study that need to be resolved. Steingart KR, Schiller I, Horne DJ, et al., Xpert® MTB/RIF assay for pulmonary tuberculosis and rifampicin resistance in adults. Cochrane Database Syst Rev. 2014;1:CD009593.